Our machine works harder, so you don't have to Our machine works harder, so you don't have to Making sausage has never been fun and easier! The Hakka® Sausage Stuffer cylinder tilts back for convenient filling also includes a metal piston with an air release valve which allows air to escape up and out of the top instead of into the sausage casing. "NEW" Hakka® Sausage Stuffer; for home use. Our advanced design will provide years of trouble free operation. 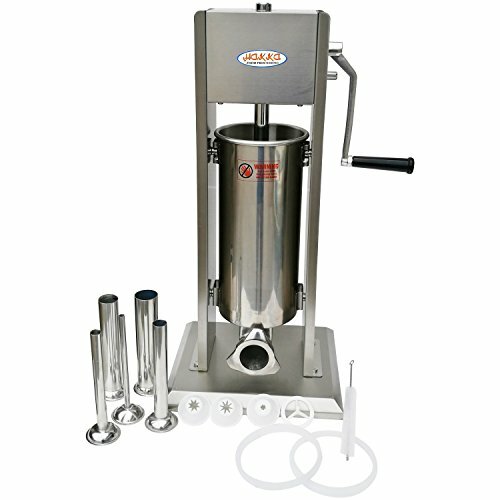 The stainless steel frame securely locks the stainless steel meat cylinder into place and reduces movement of the cylinder during operation. The re-designed frame adds to the stuffers' over-all stability and perfectly aligns the piston inside the cylinder to reduce O-ring friction. Especially hardened resin gears are mounted on a double threaded steel rod for smooth, seamless operation and exceptional control over output of meat into casings. The 15 Lbs. stuffer's frame and base are made of stainless steel, meant for safe sanitary meat processing. Base is easily mountable to most surfaces. 3 different size churro maker parts. All parts that contact food directly are reach up SGS food hygiene standard. If you have any questions about this product by HAKKA BROTHERS, contact us by completing and submitting the form below. If you are looking for a specif part number, please include it with your message.